I offer three "levels" of paint jobs. All prices include assembly and one type of basing (SGP+ has three). Below is a description of each along with pricing tables. Three-color minimum: This is a requirement for paint jobs at some 40k tournaments, i.e. Bugeater. This level of painting has very few highlights and focuses on bringing a solid model to the table that easily meets most standards of painting. 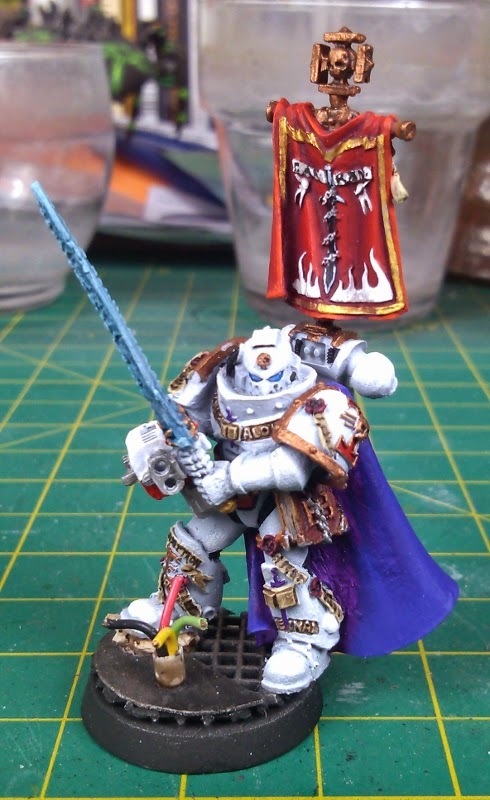 This is an example of three color-minimum with one type of basing. Above table top: This level of painting contains highlights and focuses on gear the model is carrying. This brings a well-received model to the board that exceeds most models on the table. This is an example of above table top painting with three types of basing. SGP+: At this level the model is the avatar of the general on the table. Painted with high detail the intent is when this model is placed on the table, the rest of the board disappears. This level contains three types of basing. For example: rocks, grass and debris. This is an example of SGP+ and contains three types of basing. Magnets: I can magnetize joints and weapons. The cost is $0.50 per magnet. Banners: Banners come molded or can be designed free-hand. Molded banners are $25+. Free-hand are $125+. You can send models already assembled or have me build them. Either way, my fee is the same. If you'd like me to purchase the models, you will need to send the funds prior to purchase. I can buy models at a 15% discount off the list price. Quotes are good for 30 days. All commissions are split into three payments. The payment schedule will be determined between client and myself upon deciding to work together. Progress photos will be provided as work is completed. The remaining balance is due before models are shipped. SGP accepts money orders, personal checks and PayPal. If you do not pay within 60 days all models become property of SGP. Shipping within the continental US is $25, to other locations may be more. It will be calculated as I complete your quote so that you will know in advance. Postal insurance is recommended but not required. After final payment is received the item will be shipped within 3 days. Package will require a signature upon delivery so that I can ensure that it is received. If you're willing to meet at a game store in Roseville, MN, I will be happy to deliver your order to you in person. If models do not meet customer's approval and no compromise can be reached models will be sold. If any funds remain after covering commission fees, the rest will be given to the customer to cover the cost of the models.